As my dog Valentino and I stood by the gate to the pond, the park ranger asked, "Does the dye in the pond tint your dog's fur since he has so much white?" "No. I had no idea the pond water has dye in it." But now that I was looking closely as Valentino stepped into the pond... Yes, the water color was a brighter blue than usual! The park ranger assured me this was not chemical dye, that it was food coloring. 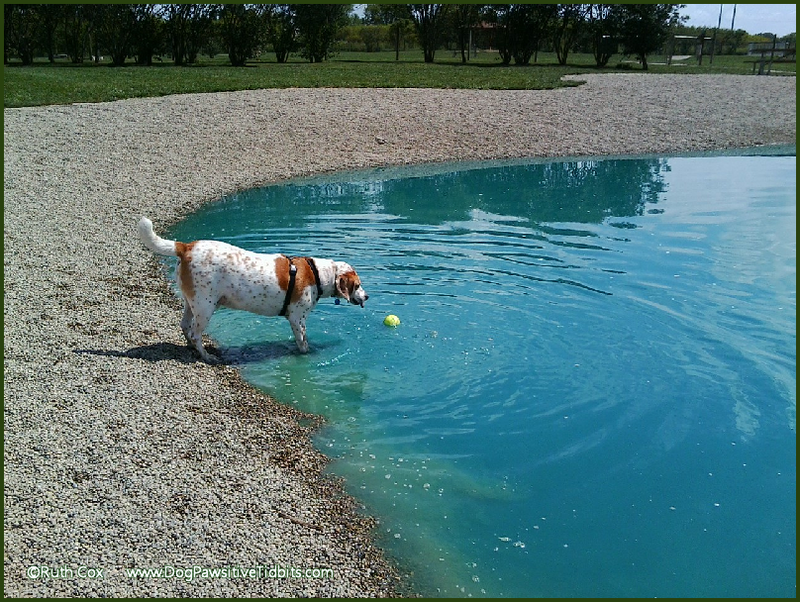 She also assured me it was safe for the dogs that would swim and play in the pond. She went on to explain that the food coloring would help control algae growth by filtering the harsh sunlight. Okay, I learned my something new for the day! There were no other dogs at the park this afternoon so it was relaxing for both me and Valentino. 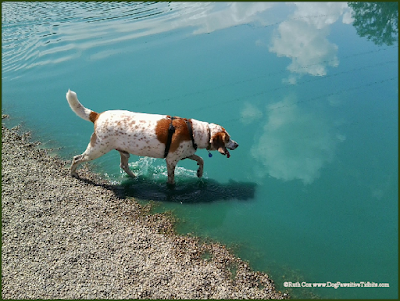 I loved the reflections on the water in this dog picture. My dog has his head in the clouds! I also discovered an article that has the recipe for making your own pond dye, which can be used in decorative ponds and fountains, even aquariums. What color would you choose? Valentino chews on a dog pond toy. We love that the park and its patrons leave toys for other dogs to enjoy. Valentino managed to retrieve one of the floating water dog toys from the pond and off he ran for a bit of chew toy time. It was a great day at the dog park for me and my boy. I appreciated our one-on-one time, although we sure did miss our dog pals. We invite you and your pets to pal around with us today by adding a link to your latest pet post to the not-so-wordless Wednesday linky list below. All pets are welcome, not just our dog friends...smiles. Ruth Cox is an Amazon Associate and may earn commission from purchases made through links in this article. 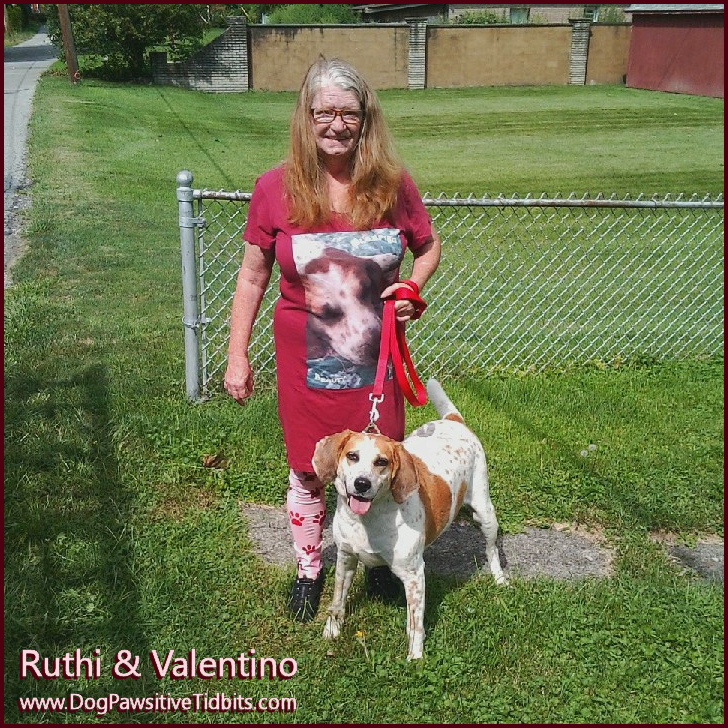 Today my dog Valentino and I strut our stuff in style with our Sleeping Beauty paw print leggings and T-Shirt dress. While the T-Shirt Dress is designed for sleeping, always a rebel...I plan to where it dog walking my canine companion, Valentino. But of course, the paw print leggings are the perfect pairing for the outfit for strutting around the neighborhood with Valentino. 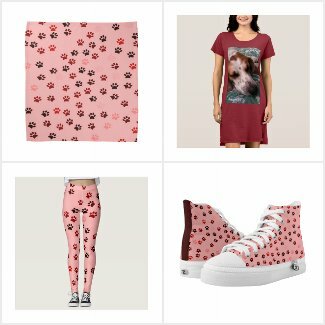 To complete the look, I will need to buy a bandana for my boy and a pair of sneakers, both of which match my outfit and are also available for purchase in our Dog Pawsitive Tidbits Zazzle store. 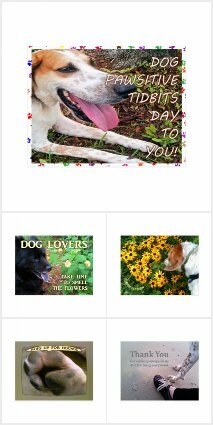 Ruth Cox is a designer on Zazzle and may earn commission from purchases made through links in this article. The tee is thin and quite comfy for sleeping or for wearing out and about and roomy enough to add a long-sleeved shirt underneath in cooler weather. The leggings are thick and warm. I think I may go down a size for my next legging design, as these are a bit roomier than needed and did not shrink in the washer or dryer. The print on both articles of clothing is pawsitively fabulous! All-in-all I love my sleeping beauty outfit and it's a new look for me, away from jeans and dark colors. Now to get to walking my dog so we both can lose a bit of that chubbiness I see in these pictures! My dog Valentino, my inspiration for living life to its fullest these days. This new look is created in honor of the anniversary of the creation of this Dog Pawsitive Tidbits blog three years ago, on Dog Day. 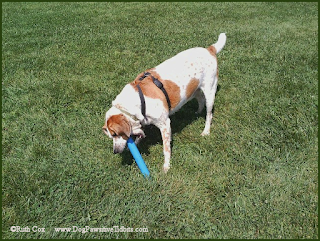 With that dog day in mind, please share any links to your dog articles in the link-up below. From now through the rest of the month of August ... Celebrate dogs! 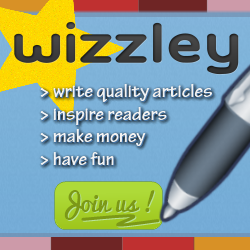 Get the InLinkz code for your articles. What Lurks in the Shadows? My dog and I enjoy shadow play in the sunshine. Sometimes our fun gives way to wondering what lurks in the shadows up ahead. Today we find it appropriate to ponder the fact that our world has gone bananas! 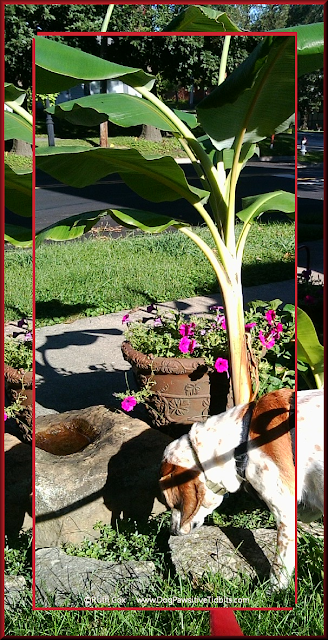 Valentino stops to sniff the flowers with banana trees in the mix of the plantings. It reminds us of the turmoil in our country (USA), our world. More importantly, it reminds us of the beauty in our world and that we must always stop for a moment, take a deep breath, and breathe in the beauty surrounding us. For today ... Forget the politics and the fear. For today ... Embrace one another and our differences. Our world has gone bananas ... trees, that is! Take a walk with your dogs today. 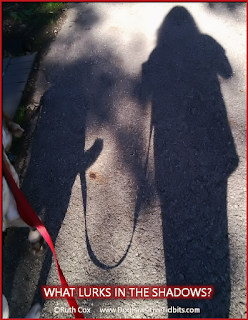 Share a bit of shadow play in the sunshine offerings of your world. Write about it! And when you do, share the link with us here at Dog Pawsitive Tidbits in a Not-So-Wordless Wednesday post. 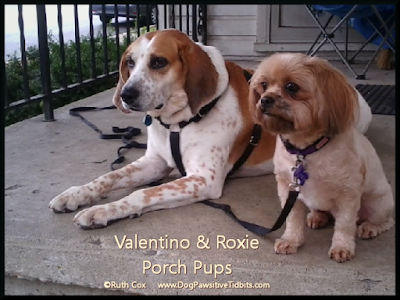 While my dog Valentino plays well with other dogs outside the home, I often wondered how he might react to the presence of another dog inside the home, his territory. Wonder no more! My roommate's girlfriend spends a good bit of time here now and often brings her little dog Roxie along. 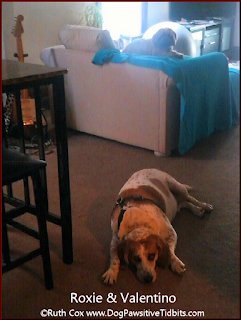 While he may grumble just a tidbit when Roxie stockpiles his chew toys, one-by-one, onto the sofa (where she knows he is not allowed) he is a good dog. 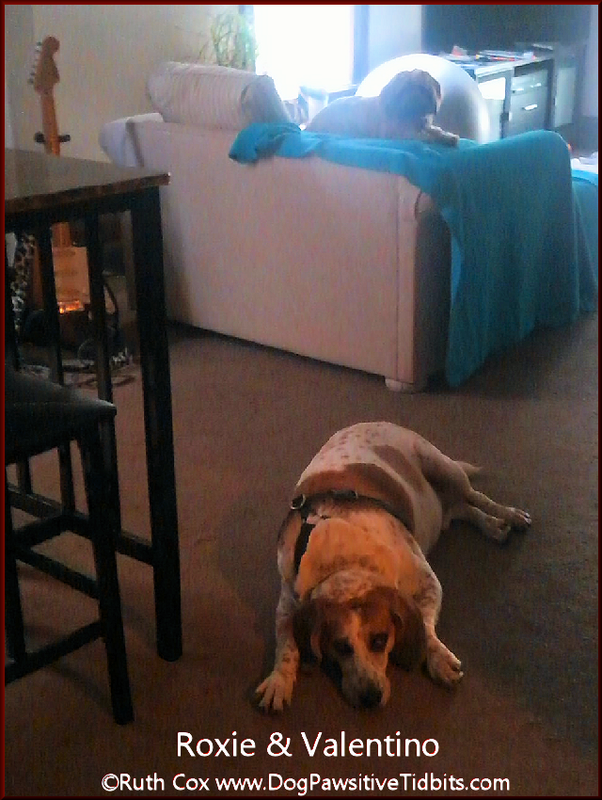 He waits patiently for Roxie to jump down and wander off so he can snag one of his dog bones off the couch! One day the three of us were on the front porch and Roxie took off. Little dogs are fast! I chased her down, put her on the porch and leashed her up this time. 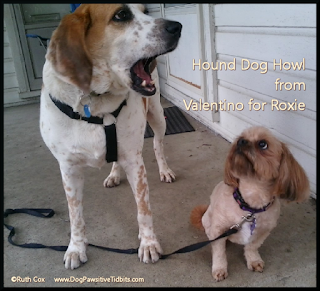 All the while, Valentino serenaded her with his hound dog howl. You can bet Roxie paid heed to his admonishing tone! As you can see, Valentino and Roxie are content to be front porch pals, sitting together as friends while watching our small town world go by. 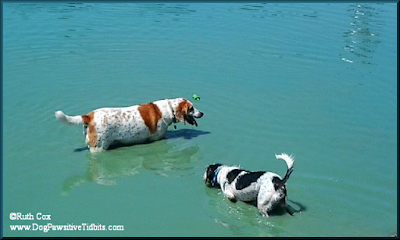 This is a Not-So-Wordless Wednesday link-up for pet lovers sharing pet pictures. Join us here at Dog Pawsitive Tidbits by adding the link to your own Wednesday pet post and Me and V will hop right over to see you! My dog Valentino had his first scheduled play date today — at the dog park! Valentino and Albus became pooch pals when my next door neighbor rescued Albus from the Humane Society a couple of weeks ago. Neither my neighbor nor I have fenced yards so we made a dog park play date for our canine boys to get together and get to know each other better. 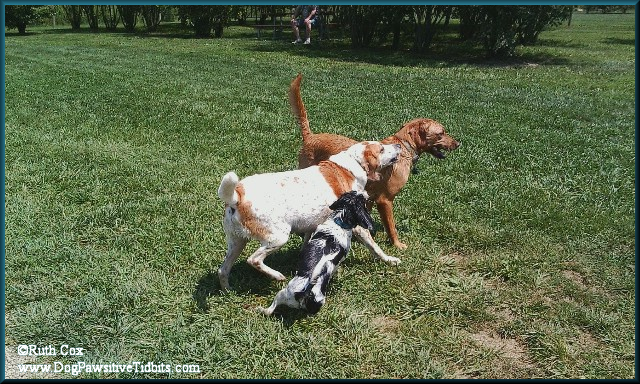 Our dogs had the best of times splashing and thrashing through the pond provided by the dog park. 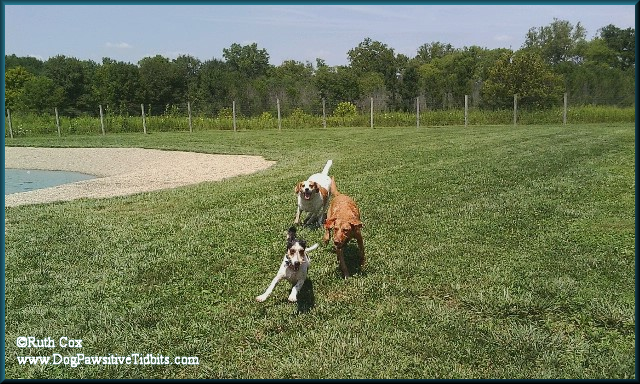 The chase is on, with Albus leading the way! 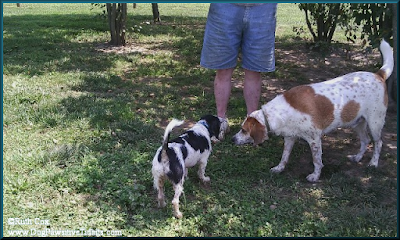 Dogs nose-to-nose in the shade. There were about a dozen dogs in the park today and all were friendly players. Many of the dog owners appreciated newcomer Albus for giving their dogs plenty of exercise as he led the way in chase after chase today. 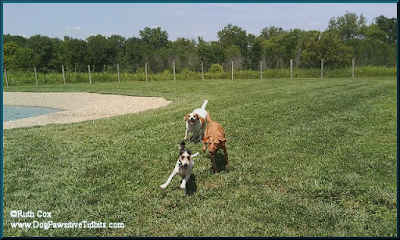 All in all, it was a great play date at the dog park for Valentino and Albus, with many more to come, I am sure. Play along with us today by posting the link to your pet articles in the Wordless Wednesday linky list provided by Dog Pawsitive Tidbits below. When Wednesday worries get you down spending time with a friend helps to ease your woes. I take a walk with my dog Valentino and that does the trick. Come hop along with us! Hop along with Ruthi & Valentino on Hump Day! 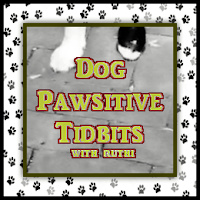 See and share all of our daily dog pawsitive tidbits on Facebook. 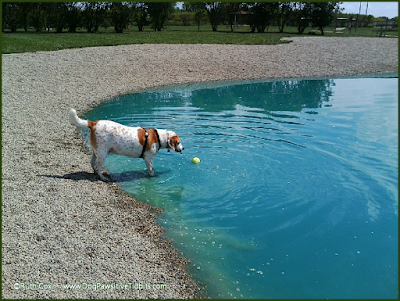 This is a Wordless Wednesday link-up for pet lovers sharing pet photos with few words. 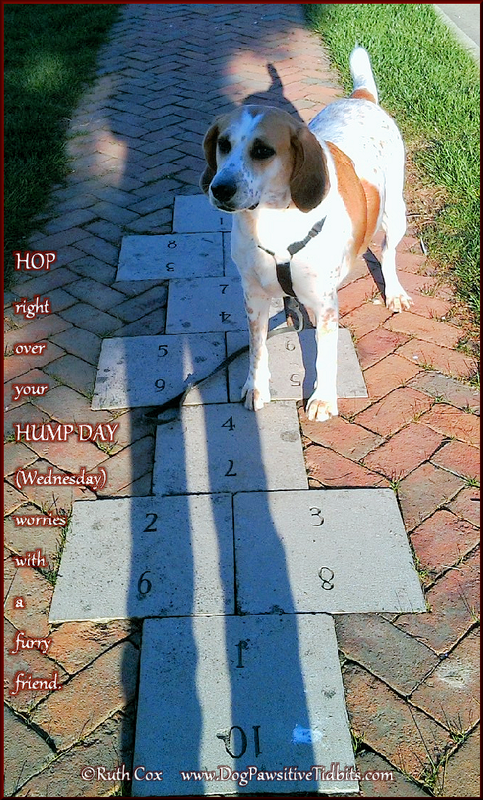 Join the fun by posting the link to your own Wednesday pet post and Me and V will hop right over to see you!